I have to admit that cooperative learning strategies were not on my radar screen when I first entered the teaching profession. I was resistant to setting up a scenario in which students would be allowed to communicate freely with one another in my classroom. I could just imagine the chaos. However, when it became clear to me that administrators were demanding that my fellow teachers and I employ collaborative learning strategies in our classrooms, it became abundantly clear to me that I needed to get on board. And, I must say that after a few trial and error sessions, that I was pleasantly surprised. Not only were the administrators pleased, but more importantly, the kids were more engaged with their learning objectives. I'm guessing that you probably already employ collaborative learning strategies in your classroom. However, my thinking is that you might appreciate additional information regarding this topic. What follows on this page (and the next several pages) focuses ENTIRELY on cooperative learning strategies--why they're effective, what options are available, how to implement them, and how to evaluate them. This section is devoted to the basics of cooperative learning--if you are already familiar with it, there will be little here that you don't already know. 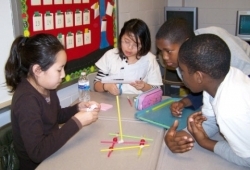 Cooperative learning is a social teaching strategy in which small groups, each with students of varying levels of ability, use a variety of learning activities to improve their understanding of a topic or subject. Each member of a group or "team" is responsible for learning what is taught, and in turn, each student helps their fellow teammates to learn. Students work through a given assignment until all group members successfully comprehend and achieve closure. Because of the cooperative nature of this strategy, students strive for mutual benefit so that all group members gain from each other' s efforts. The mindset here is that YOUR success benefits me and MY success benefits you. Each team member realizes that they share a common fate. Collectively it becomes a matter of everyone sinking or swimming. Because no one wants to sink, cooperative learning activities are highly motivating. Although success is not entirely guaranteed, the achievement of each individual participant is amplified by the team to which they belong. This, of course, make success a more likely outcome. The benefits of group learning are plentiful. One obvious benefit, of course, is that the kids themselves get to do the talking INSTEAD of the teacher. And, that can lead to problems occasionally. See the section below regarding the disadvantages of cooperative learning. Given these research findings, is it any wonder that administrators insist that we regularly provide cooperative learning activities in our classrooms? What follows at this point and the five other pages related to cooperative learning includes grouping strategies, strategies for assigning individual tasks, activities for seven free jigsaws, and instruments of evaluation for cooperative learning strategies. These details will include the nuts and bolts of how to construct and set up these activities. Additionally, I'll offer suggestions on how to maximize the effectiveness of this teaching strategy. If you haven't bookmarked this site yet, please consider doing so, as there is much more to come. I would suggest that you arrange the desks or tables in your classroom in sets of four, if possible. Smaller groups of students function best because each kid must shoulder more of the responsibilities. Groups of three or five are workable but not as beneficial to individual students. 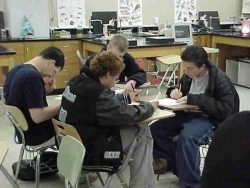 If desks are arranged in groups to start with and remain that way daily, rather than requiring adjustment of the room or the seats, students become part of those groups and respond naturally and willingly to any group activity you choose to do. This allows for spontaneous group discussions when they happen, rather than having to defer a discussion until groups can be arranged. To really maximize the effect of cooperative learning, it would be useful to determine the preferred learning style of each student in your classroom. Once you know that, you can group students accordingly. For example, you would want to avoid having a group of all visual learners. Consider including a logical learner, a kinesthetic learner, and an audio learner along with the visual learner in the same group. Does this take time to put into place? Absolutely. But, I think you will agree, it will be time well spent in the long run. The section below offers practical suggestions on how to assess the individual learning styles of your students. And, the best part of all, it's FREE! 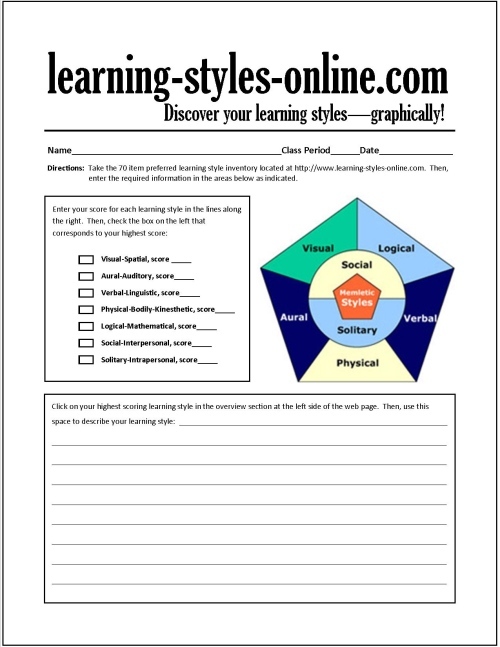 I'm quite sure that there are a plethora of websites and printed materials that can be obtained that would be appropriate for assessing the preferred learning styles of your students. In researching this page, I have come across a resource that I highly recommend. It's called learning styles online. The people behind this website offer a 70 question online inventory for assessing an individual's preferred learning style. I took this online inventory myself, and I have to tell you that I was impressed with the profile that was returned--had me nailed to a T.
The scores returned with this instrument include a complete description of the traits of each learning style. Although it's possible to attain the score of 20 points in any particular category, I would think that would be rare, as each person has a combination of learning styles. In my case, I scored 16 points in the logical learning style category, 14 points in the solitary learning style, and 13 points in the verbal style. I would highly recommend that you assign your kids to complete this inventory and report their results to you. Perhaps, you could schedule class time in one of your school computer labs in order for all of your kids to complete this inventory. You, as the teacher, would NOT receive the results of all of your students in one convenient report. However, if you were to require them to do this and complete the following form, you would be in a position to make crucial decisions about group assignments. You may download this form completely free of charge here. This site also has quite a selection of a free "brain power" games. Your early finishers could entertain themselves while their classmates finish their inventories. A complete class period in the computer lab is all planned out and ready to execute! If you have tried group learning activities with your kids, I'm sure you will agree that just like any other activity undertaken in the classroom, there are pitfalls lurking. For example, students lacking social skills would not know how to work in groups and this could result in task or social conflicts. Another disadvantage is the group grades. What if only one student is working in a group and all the others are just enjoying the grades due to his hard work? And, then there's the fear of failure. A student who might want to avoid failure might not participate in the group task and instead call the task "stupid" and then accuse his or her group members but being "dumb." Furthermore, competitions will start between teams, and the team not winning will stop trying. Another consideration is that when you are controlling many groups, you never know when a single group goes off-track from the task until you find out a lot of time has been wasted. Probably the worst disadvantage of cooperative learning is that the parents of high achievers may complain that their son or daughter is being used to teach the dummies in the class. In spite of the disadvantages listed above, in my opinion, there is a lot to be said about the power of cooperative learning in the classroom. Kids just seem to engage more intensely with the task at hand when it's placed in a mutually supportive social context. And let's not forget our dear administrators! They just love to see kids engaged in cooperative activities and that bears directly on our evaluations. At this point, my plan is to continue to provide you with more material regarding cooperative learning--the nuts and bolts of how to plan, structure, implement, and evaluate the specific activities mentioned previously. So many things to get to, and so little time—I’m sure you know the feeling. Have a great year!